Manufacturing is integral to the success of the UK economy; as more and more businesses embrace automation as a means to future proofing their operations, access to industry leading knowledge, expertise and equipment for local businesses becomes an important stepping stone, when implementing automated robotics. HVM (high value manufacturing) Catapult centres were therefore introduced by the Government as a means to turn ideas into commercial reality and providing SME’s the best opportunities for growth. The AFRC (Advanced Forming Research Centre) is one of seven, though the only one based in Scotland providing businesses of all sizes, from all sectors access to collaborative working opportunities. In order for businesses to achieve the best outcome and bridge the gap between solution concept and design the AFRC are incorporating industry leading KUKA robotics equipment into their technology & innovation centre at Strathclyde University, as part of a two year partnership deal. Through the support of KUKA Robotics, the AFRC will work with businesses looking to integrate robotic technologies into new and existing applications, supporting sustainable growth and also provide a route from academia to industry for many local students forging a career within manufacturing. KUKA Robotics CEO, Jeff Nowill said of the partnership: “The AFRC are a leading research & development facility in renowned for their world leading research, and to be presented with the opportunity of a partnership is extremely pleasing. 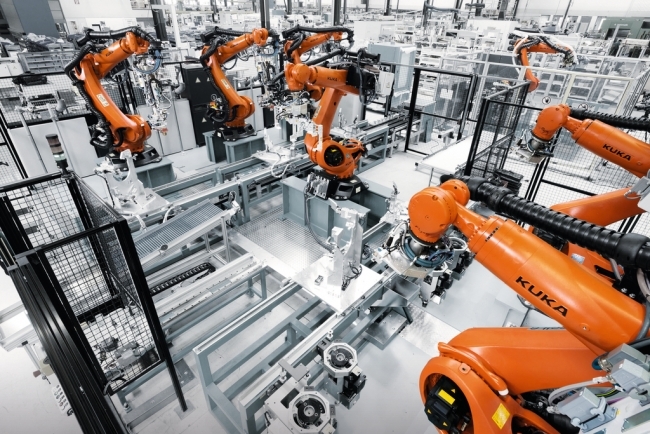 The combination of the AFRC’s thought leadership and KUKA’s industrial robots and automation solutions, as a means to developing sustainable manufacturing solutions is an inspiring prospect”. “Whilst we are interested in looking at innovative collaboration with the AFRC on a per se basis to our advantage within the United Kingdom and abroad; the Glasgow-base is also of geographical interested to us. The KUKA Group bases its 400+ UK-based employees in four locations in Greater Birmingham, and part of our commitment to be a lithe, decentralised modern business, operating close to our customers, Scotland is of huge interest to us. In late 2016, we opened a facility in Dundalk to service the Irish market; and now we are – and have been for some time – looking at our proposition north of the border to service our Scottish customers with a local office and staff. A permanent presence at the AFRC is an important stepping-stone in that journey”. The partnership between the AFRC and KUKA, further cements KUKA’s position as one of the UK’s leading suppliers of automated robotic technology and supplier of choice to no less than four catapult centres across the UK.